“Wellness” today is so much more than gym memberships, calorie counting and Lite n Easy meals – and the community, including companies, small businesses and employees are all taking notice. Communities are now embracing an all-encompassing or a holistic definition of wellness – moving away from just physical fitness and stringent diets to a broader mindset of the aspects that make up one’s wellbeing. The various aspects may include physical, financial, emotional and social wellbeing and sustainability. With the momentum gained by a holistic approach to wellness and the wellness movement generally in the last few years, many individuals feel a bit overwhelmed with all the options available to them to help optimise their wellbeing? Eco-organic vegetables, superfood herbs, yoga, Pilates, CrossFit, mediation, aromatherapies, green smoothies. And the list goes on. Many individuals living the modern city life are time poor and, with the limited time available at hand, might find the wellness information overload confusing, resulting in individuals not knowing where to start their wellness journey. We totally get this. Our philosophy is: when it comes to achieving optimal wellbeing, ditch perfection for progress. Done is always better than waiting for things to be perfect. · Movement: There are so many forms of exercise you can do these days to keep active, but nothing beats a simple 30 minute walk outside amongst nature. For those who live near the office, try to swap the bus ride home for a brisk walk twice a week and you will feel the impact to your mind’s clarity and creativity. · Nutrition: Always go for whole foods. These don’t necessary need to be organic, superfoods and all the other buzz words, but simply fresh, whole foods that are not processed. · Mindfulness: Starting the day with meditation can really set your day up to a clear, productive and creative start. Many find meditation difficult thinking that meditation must be sitting still, with no thoughts on your mind whatsoever. However, we consider reading a book and sometimes, even walking in the park, to be meditative. The key is finding what brings you to a state of being fully present, in the now. · Sustainability: Swapping out your deodorants and detergents for non-toxic chemical-free alternatives is a great way to start exploring this aspect of wellness. At the end of the day, a holistic approach to wellness is about working on your body, mind and soul so you can achieve a beautiful blend (not balance) of fulfilment in all areas of life. So if you’re overwhelmed by the choices, try breaking it down into the four pillars of wellness above to see if it works for you. At Bare & Wilde, we host wellness events and curate wellness subscription boxes to break through the wellness noise and simplify the tools and resources you need to live your best and healthiest life. 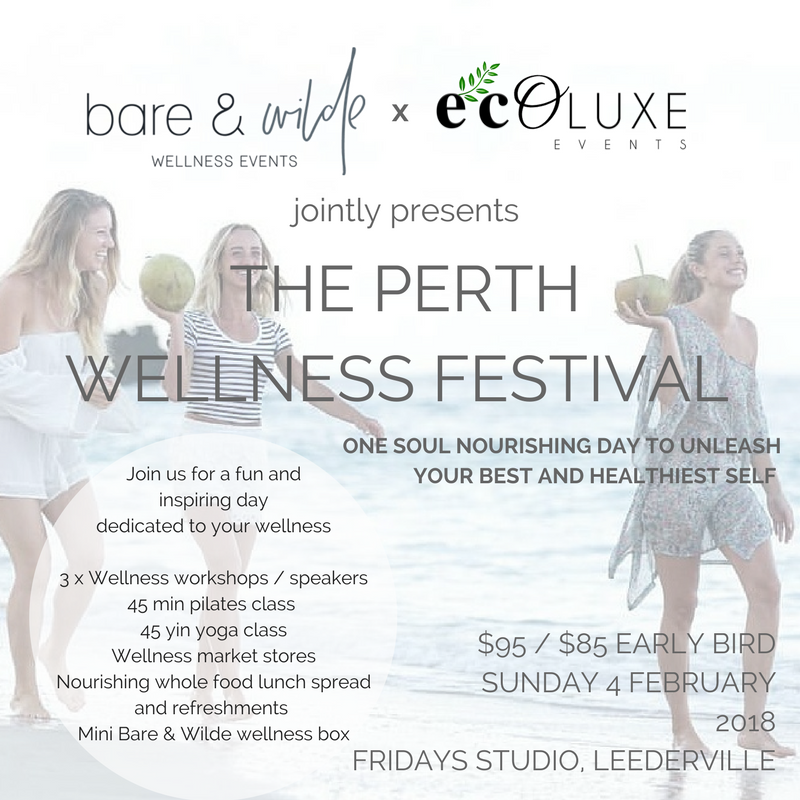 If you’re in Perth, you might want to check out our upcoming Perth Wellness Festival on Sunday, 4 February 2018, which has workshops dedicated to each of the four pillars of wellness above. Founder of Wellineux, Amanda McMillan will be presenting the Mindfulness Workshop, focussing on the importance of developing a growth mindset and how that impacts your wellbeing. You can find the link to the event here. If you are interested in finding out more about our wellness events or wellness subscription boxes to help kick start and simplify your wellness journey, you can get in touch with Amy from Bare & Wilde at amy@bareandwilde.com or visit www.bareandwilde.com for more information.